According to the latest market research, the world hair care products industry is expected to reach a value of almost $58 billion by 2015. This represents an impressive 18% expansion from the 2010 revenue of $49 billion, based on figures provided by MarketLine. One of the key drivers behind this rapid growth is men’s increasing engaging with the industry. In particular, men’s hair color is a rapidly growing sector. According to Multi-sponsor Surveys, the percentage of men coloring their hair is on the rise, leaping from 2% in 1999 to 7% in 2010. For older men, the figure rises even more, with 11% of those aged between 50 and 64 confirming that they color their hair. It’s a trend that Rodney Gentry, a color specialist at Sachi Studio's in Scottsdale AZ, is well aware of, having seen more and more men queuing up for his Goldwell hair color service in recent years. Men’s reasons for coloring their hair come down to personal choice. For younger men, a complete change in color is often part of their journey to find their own personal style. Reality television shows have had an influence on this, with the Los Angeles Times reporting that programmes such as Jersey Shore and True Blood have inspired men to go for dark colors and highlights respectively. For older men, hair coloring can often be about retaining a youthful look and feel. This can be for personal pride, for the benefit of their wives or to ensure they remain as competitive as possible in the workplace in our increasingly youth-focused culture. Seeing icons such as rock stars ageing with no sign of going gray no doubt also has an influence. While for younger men a complete change of hair color is often a popular choice, color specialist Rodney Gentry has found that his older clientele often prefer a more subtle change. Gray blending, where the hair is colored but a natural-looking peppering of gray is left, can ensure men look more youthful, without it being entirely apparent that they have had a color treatment. According to the Washington Times, 50% of people have at least 50% gray coverage by the age of 50. For many men, this is simply no longer acceptable. When considered in simple terms, the advantages to men of coloring their hair are clear. Hair coloring is a quick and effective means of looking more youthful. It is less costly then joining a gym and certainly requires less effort. It is easier than dieting and the results can be seen far more quickly. It’s also a lot cheap and less drastic than making permanent changes through methods such as plastic surgery. As the men’s hair coloring industry continues to grow, Rodney Gentry has found that men have become more discerning about the products that they use. It was this knowledge that prompted him to commit to the market-leading Goldwell hair color system. Goldwell’s focus on achieving color perfection and allowing color stylists to excel at their craft has long attracted women to the brand and now men are following suit. 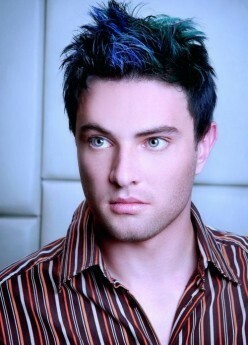 Men are also becoming wiser when it comes to protecting their colored hair. The additional needs that colored hair has are no longer such a mystery and many clients are keen to consult Rodney for his hair color care tips, to ensure they get maximum benefit from their color treatment. Rodney advises them to avoid washing their hair for at least two days following the color application, to avoid the color being drawn out by the water used during washing. He also advocates the use of color protecting shampoos, which are again becoming increasingly popular with male users. For the men of Scottsdale AZ, whatever their myriad stated reasons for choosing to color their hair, the process essentially boils down to one fact – men who have colored their hair end up feeling better about themselves. It is this key driver that makes men’s hair color such a booming industry. In the same way that women’s hair color has taken off over recent decades, with Statistic Brain reporting that 75% of women now dye their hair in some form, men’s hair coloring is experiencing a massive increase in popularity. It’s a trend that seems set to continue over the years ahead, as society’s focus on appearing youthful shows no sign of abating any time soon. And, indeed, in a world of increasing equality between men and women, it should come as no surprise that men have come to accept that coloring their hair is an acceptable, cost effective means of feeling good about themselves. Scottsdale AZ. Call 480.639.2000 to discuss your color requirements and make an appointment. You will love the results!